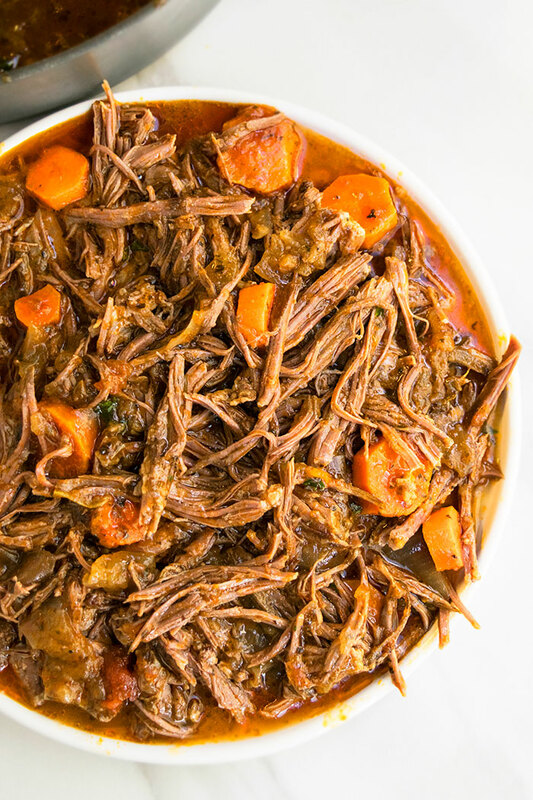 Easy pot roast recipe, made in one pot with simple ingredients. It’s juicy and tender and loaded with tomatoes and herbs. 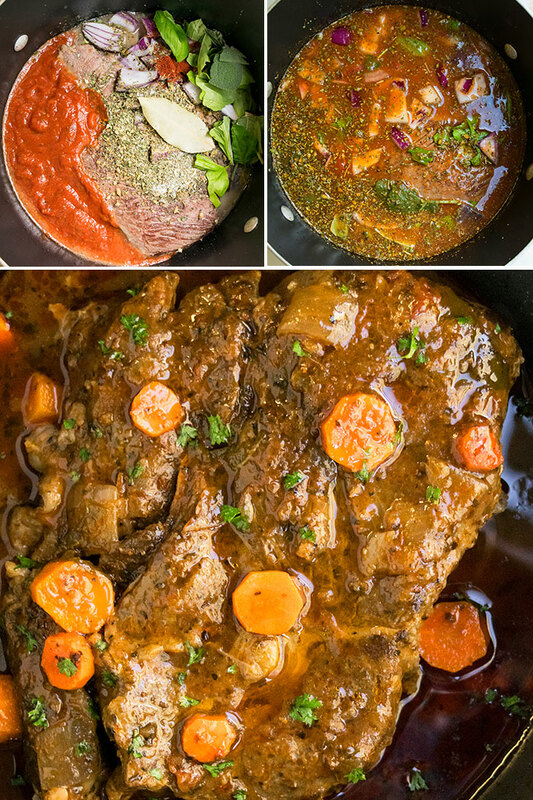 I am very fond of roasts and I am so excited to add this one pot Italian Pot Roast recipe to my growing collection. 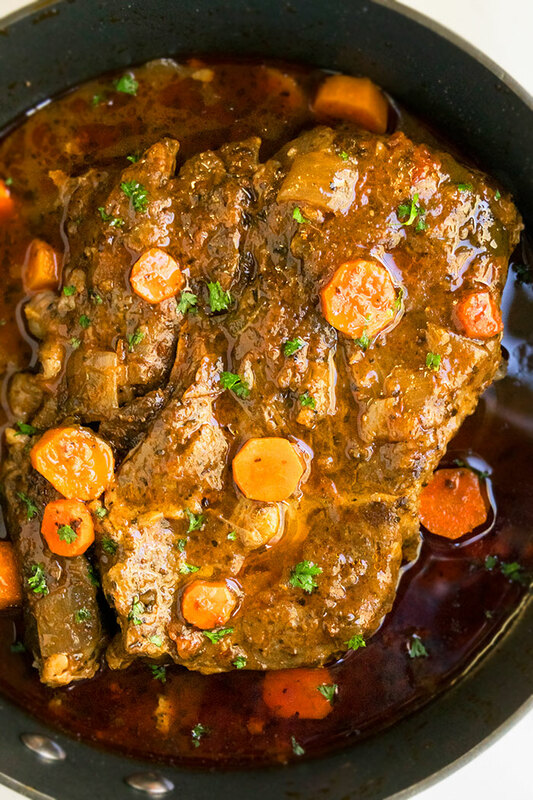 So far, I have this Easy Pot Roast Recipe (Stovetop & Oven) and this Slow Cooker Mississippi Roast. They are all really easy and full of flavor and the whole family approves. Add that into a crockpot, along with all the other ingredients. Lower the amount of liquid by 1 cup. Cook on low heat for 6-8 hours or until beef is very tender. Slice a good quality bread like ciabatta in half and fill it with shredded Italian beef, onions, tomatoes, lettuce, mozzarella or provolone cheese and enjoy. 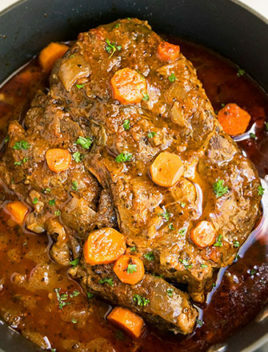 How to make best Italian pot roast? Heat oil and sear the roast and keep aside. Saute onions, ginger and garlic. Add seared roast back into the pot and add tomato puree, tomato paste, broth, red wine, carrots, celery, herbs and seasonings. Then, cover and cook in the oven until meat is tender and you are done. What roast is best for pot roast? Chuck roast is the best. Do you have to brown a roast? It is best to do it so as to enhance the flavor. What to serve with pot roast? What sides go with a roast? Italian red wine is optional and can be replaced with beef broth. Adjust the amount of seasonings and herbs, based on your preference. If the sauce is too thin, thicken it by reducing it on the stovetop. If the sauce is too thick, add a little more broth (1/4 cup at a time). Use low sodium broth to prevent the roast from becoming too salty. Heat oil in a nonstick oven-safe pot or Dutch Oven over medium high heat. Add the chuck roast and season one side with salt and pepper. Sear it until golden brown. Then, flip it over and season the other side with salt and pepper. Sear it. Sear and brown the sides of the roast too. Remove roast to a plate and keep aside. In the same Dutch Oven, add onions, garlic, ginger and saute until golden brown and fragrant. Add the roast back into the Dutch Oven. Then, cover the Dutch Oven with lid and transfer to oven. Bake at 350 degrees for 3 hours or until roast is tender and easily breaks away with a fork. Thicken the sauce on the stovetop by cooking it without lid over medium high heat for 5-10 minutes until you reach desired consistency. Now, you have 2 options: Shred roast with 2 forks OR remove it and cut into large pieces and add that back into the pot. Enjoy! This is such a delicious meal! Everyone fights over the leftovers the next day! So easy and delicious! The ultimate comfort meal!